The concept of "Orientation" is the fourth composition topic this month for the Boost Your Photography: 52 Weeks Challenge. 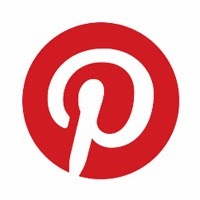 (Join the Google+ Community to share your weekly photographs and receive feedback.) The previous topics this month were the Rule of Thirds, Leading Lines, and Fill the Frame. In photography, orientation refers to the way you take and display your photographs. The vast majority of photographs from DSLR and point-and-shoot cameras are taken with a 'landscape' or horizontal orientation, where the photograph is longer than it is tall, while the advent of cell phone cameras and sites like Pinterest have helped bring attention to the less common 'portrait' or vertical orientation, where a photograph is taller than it is wide. Even the terms that we use to refer to this orientations - landscape and portrait - imply that some subjects are better suited to one orientation than another. The point of spending a week focusing on orientation is to help you to remember that you have a choice. Many of us are so "programmed" to use our camera in its default orientation that we rarely think to turn it sideways and explore another view. Even cell phone camera users are seen to turn their phones sideways to snap horizontal photographs almost by default, even though their actual default orientation is vertical. Before you even take a photograph this week, stop and ask yourself why you are using the orientation you are in that moment. Is there a compositional or photographic reason for it or is it simply the orientation your camera had when you picked it up to start shooting? If you don't have a reason for it, don't start shooting. Take that extra moment to consider the question of orientation and what would best fit the photograph and composition that you want to capture. Orientation in Action: go vertical! I will readily admit that my photographs are more commonly taken using a horizontal or landscape orientation. But the more time I spend reading about, learning about, and exploring my photographic journey, the more I try to push myself to consider orientation when composing my shots. The following series of photographs are some comparison images of times when orientation made a measurable impact. Want to capture this style of image? 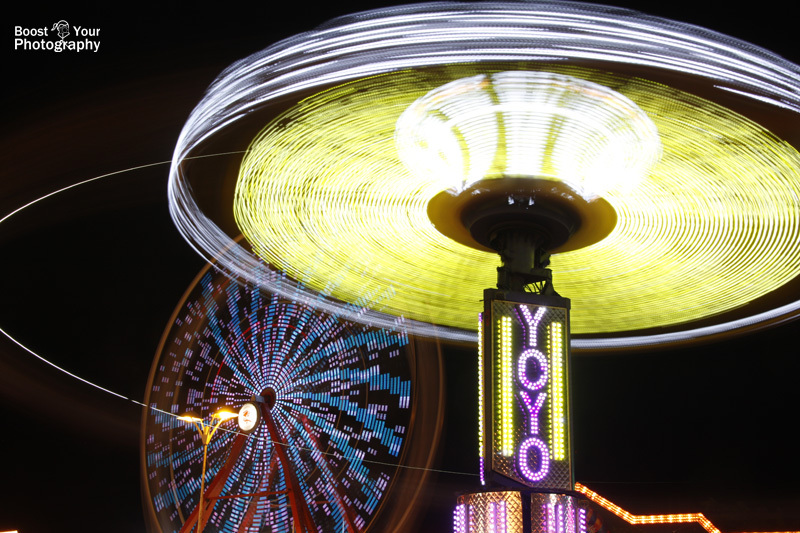 Read Long Exposure Photography at the Fair(e). 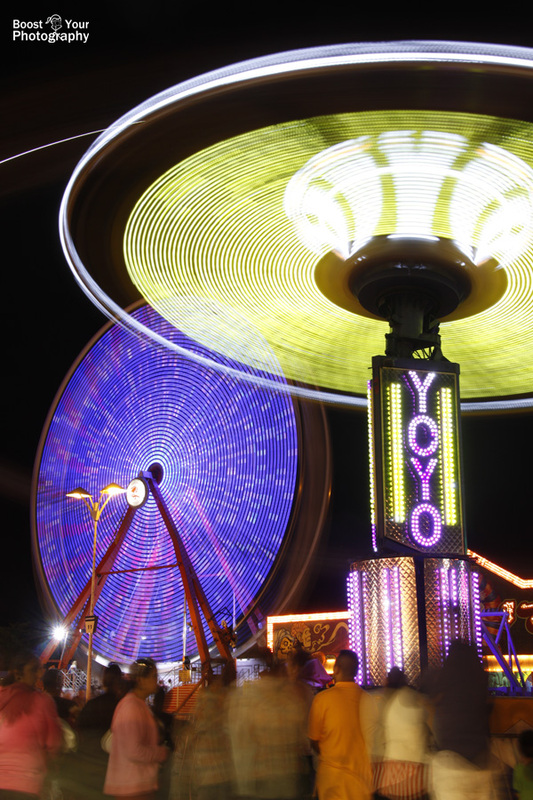 I had been out shooting at a carnival with the local photography group. The image above represents my initial composition for this scene, as I like the combination of the two rides: the YoYo flying swings and the Ferris Wheel in the background. A horizontal orientation worked well here to capture much of the extent of the YoYo ride and its spinning swirl of lights. I realized, however, that I could tell a different story if I tried a vertical orientation. Recomposing the shot (still from the same location) allowed me to include the carnival-goers in the scene. The long exposure (5 seconds) led most of the people to be blurry, but I especially liked the contrast between their motion and movement with the stock-still standing of the man in yellow. While the vertical orientation cut off more of the lights from the ride, it allowed me to tell a fuller story in one photograph. The horizontal orientation is colloquially called "landscape" for a reason. Many, many landscape and nature photographs are shot in landscape, as this orientation allows you to feature a wide view of a scene. 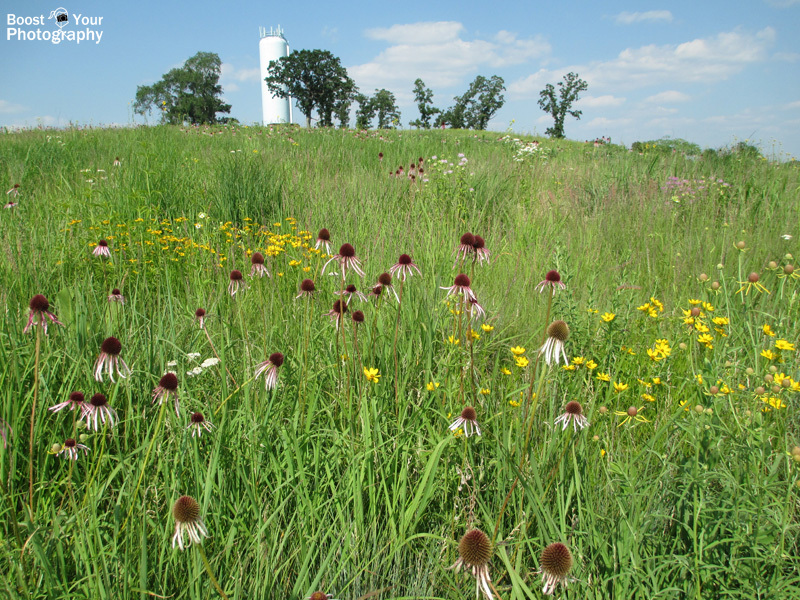 In this photograph, the prairie flowers are featured in the forefront, with a little additional interest provided by the trees and water tower in the background. Using the vertical (portrait) orientation completely transforms the feeling of the same scene. 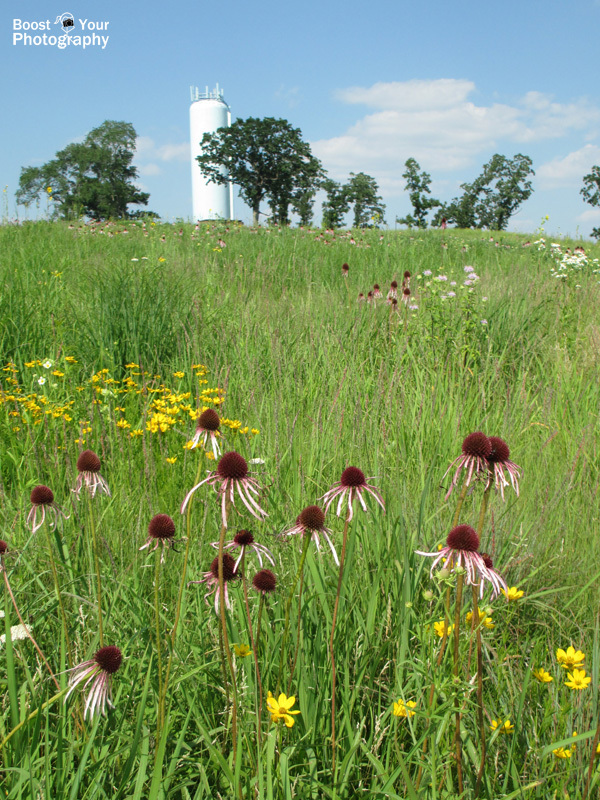 Now the prairie flowers are closer, larger, and draw more attention. The vertical orientation also elongates the feeling of depth in the image and gives a much more wide angle feel to the view (even though both shots were taken with the same point-and-shoot camera and focal length). A great example of how "landscape" orientation is not always the best option for your "landscape" photograph! While you should always consider your orientation when shooting, you can also play around with changing the orientation afterwards in post-processing. While out shooting this sunrise over the Madison capitol and skyline, I experimented with a number of different orientations, focal lengths, and compositions through the progress of the sunrise. In this particular image (SOOC on top), I realized that all of the blank gray-blue of the clouds was not really adding to the photograph and that I really wanted to feature the reflections of the sun in the water. My final, vertical crop is shown, both as it appeared on the original image, and the final, cropped image. The vertical orientation features the long, vertical sunrise reflection (and light in the sky), while the closer crop allows you to better see and appreciate the Capitol silhouette and the two small birds in the sky. Do not let your photographs be defined by the default way that you hold your camera or camera-phone. Make orientation a conscious part of your photo-making process. Before you press the shutter, think about whether the orientation you are using is the best to for the subject you have chosen. Do not fall into the trap of thinking all landscape shots must be horizontal or that all portrait shots must be vertical. The more thought you give to your image beforehand, the better your final photograph will be!